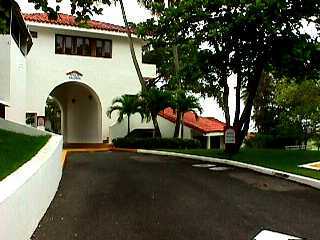 Click Here to view a list of available Rental Properties at the Rio Mar Resort! The Westin Rio Mar Resort is located in Puerto Rico, between the Atlantic Ocean and El Yunque National Forest. It is set along a two mile stretch of beach in the municipality of Rio Grande which is about a 35 minute drive (or shuttle ride) east from the San Juan airport. It is both a vacation resort and a sophisticated limited access residential community with many different condominium home developments throughout. Th e Westin Rio Mar Resort offers horseback riding, two golf courses, diving and snorkeling classes and tours, deep sea fishing expeditions, restaurants, nightclubs, and a full casino. The Resort and Casino opened in August 1996. The hotel itself is in the style of a Caribbean Manor House design that offers suites, a spa, pools, professional tennis courts, two golf courses, biking, water sports, a business center, restaurants, and meeting facilities. A set of new high end beach villas located just west of the hotel complex has been recently constructed and available for daily and weekly rentals. Suggest contacting the resort directly to reserve any of these (click here) until PRwest establishes a direct business relationship with the resort management. Most of our vacation home customers spend their time at the more affordable 'rio mar cluster' communities situated along the western perimeter of the Westin Rio Mar Beach Resort complex (click here for resort map). The clusters are named Cluster 1, Cluster 2, Cluster 3, and Cluster 4. 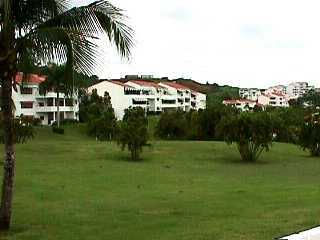 They are all golf course communities situated on a hillside and just short distance from the beach. Some of the homes follow the edges of the western fairways of the 'Ocean Course'. Two of the cluster communities (Clusters 2 & 4) have pools. A main beachfront pool with Gazebos and picnic areas is available for use by all residents. 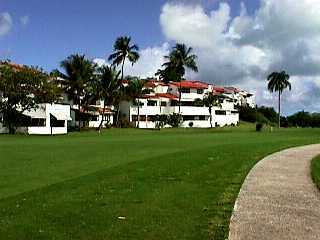 It is located just north of the clusters next to the ocean at one end of the 18th hole fairway. The Beach, Golf, and the Casino... may be the principal reasons why people come to Spend their Vacation at The Rio Mar Beach Resort... to get a nice sun tan, or relax in the warm water of the pink color beautiful beach. Wind Surfing and body boards are very popular here! Golf Club. 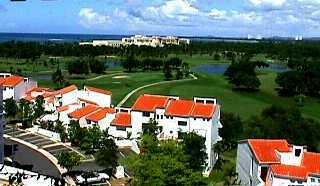 .. Two world-class 18 hole Golf Courses are located at The Westin Rio Mar. A River/Lake course (a 7,000 yard par 72 layout designed by Greg Norman), follows the beautiful Mameyes River. Watch out for the back nine on this very challenging course! And watch out for the Iguanas! The Ocean Course (a 6,800 yard par 72 course designed by Tom and Greg Fazio - located west of the Club House), is a well maintained and beautiful course offering scenery and lots of challenge. Westin Rio Mar has a 13 court championship tennis center with soft and hard clay courts. Doubles, instructors, and other activities are available. Wind Surfing, Jet-Ski, Sailing, Scuba Diving, Deep Sea Fishing. The clear blue Atlantic waters offer an abundance of blue and white Marlin, Bonito, Albacore, Allison tuna, Bonefish, Tarpon, Jack, King, Dolphfish, Sailfish, Grouper, and Wahoo. Horseback Riding...Trail Rides at a large equestrian center (Carabali Equestrian Center) are available 10 minutes outside of the resort for your riding enjoyment. Paso Finos are the favorite mounts. 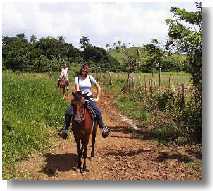 Bilingual guides accompany every group on the trail ride through the lush tropical foothills of the El Yunque Rainforest, along the banks of the Mameyes River, into the very heart of the legendary Puerto Rican countryside. Beginner, intermediate and advanced riders are welcome. Long pants are reccommended. Wear a bathing suit underneath your clothing if you would like to take a dip in the river. Then we suggest that you sun dry, or bring a towel along. Other Activities...A complete fitness cener and spa are on the property, a shopping arcade, a beauty salon, and organized adult and youth activity programs are available. A large swimming pool with separate children's wading pool is perfect for lounging and refreshment. Villa Residents have accesss to a large multi-recreational interconnected oceanfront pool complex that offers lap pool, volleyball court, basketball court, slide, wading pool, barbeque areas, and two whirpool baths. There are 11 restaurants to chose from. Enjoy everything from northern Italian to Mexican specialties, or just relax in the Moroccan-style Lobby Bar, or at the Tiki Bar overlooking the Atlantic. Nightlife includes a Full-Service Casino, and a few nightclubs and dance places for unwinding after a long day at the beach. 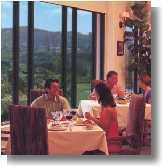 Restaurant choices include: Palio: Offering classical northern Italian dining; Marbella: Offering continental buffets and table service; Grille Room Offering Creative cuisine garnished with beautiful mountain and golf course views. ; Boleros Lounge: A tapas lounge offering appetizers or late night snacks. We can arrange for your stay at a Rio Mar Beach Resort Condominum Apartment during your vacation or business trip. Just let us know your specific requirements and we will endeavor to locate a golf studio, or a 1, 2, or 3 bedroom place just right for schedule, number of persons, and budget. Click Here to view a list of available Rental Properties at the Rio Mar Resort! Call toll free 1-888-779-3788, or send email for details.